Rystad Energy estimates that oil production from the U.S. has reached 8.5 million barrels per day in June 2014, up from 5 million barrels per day in 2008. By the end of this year, 50% of the oil produced in the U.S. will come from shale plays. 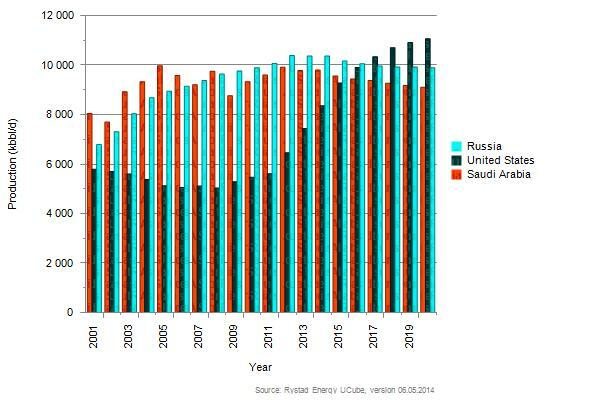 The U.S. is on track to pass Saudi Arabia in terms of oil production by early 2016 and Russia about one year later, according to forecasts from the consultants. Domestic oil production in the U.S. is now growing at the same rate as Saudi Arabia back in the 1970s. The consultancy estimates the need for seaborne net import of crude and petroleum products to the U.S. could turn to net export within three years from now. 80% of the growth this year comes from the big three plays Bakken, Eagle Ford and the Permian tight oil plays. Eagle Ford is now producing more oil than Bakken, whereas Permian tight plays will produce more than Bakken in 2017 and more than Eagle Ford in 2018.